Are you a police officer who is passionate about community engagement? Word is Bond is a local nonprofit with an inspired mission; build positive relationships between young Black men and law enforcement. Each summer, Word is Bond hosts a six-week summer internship program called Rising Leaders. Rising Leaders is a leadership development experience for young Black men where they build leadership skills and work to improve relationships between police and their communities. The theme for this summer is I am somebody. Word is Bond is seeking officers passionate about community engagement to participate alongside our cohort of youth leaders in the challenging and empowering work of reframing how young Black men and police engage in our communities. 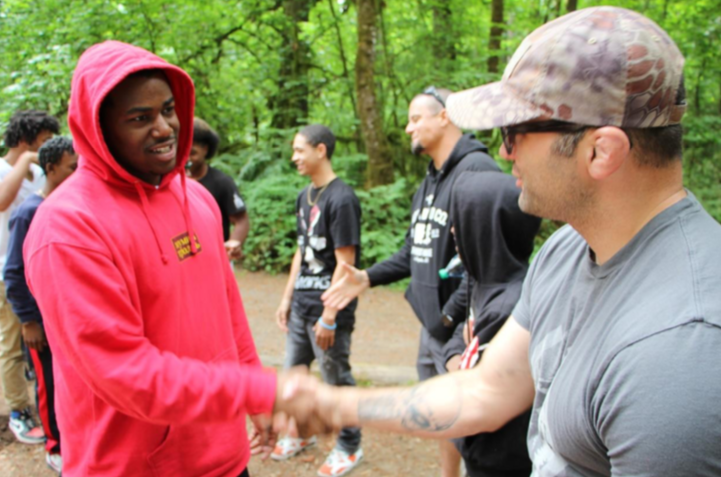 Officers first meet the youth participants, known as community ambassadors, in the second week of programming on a ropes course facilitated by our partners at Northwest Outward Bound School. The relationship building starts here; working on challenging, team activities where the community ambassadors and officers step out of their comfort zones and complete activities together. Throughout the next five weeks of the program, officers join youth participants for “Engagement Days” where they participate in workshops that focus on story sharing, listening and relationship building. Each Engagement Day, youth and officers get to know each other more and build up towards more challenging discussions on race, history and trauma. The program concludes with a community showcase where youth present their video projects and discuss their experiences along with police participants to family, friends, and community, who are all invited to join in a celebration of this powerful six-week experience. Q: What is the total ask of the officer? A: Word is Bond is asking for a 50-hour commitment over six weeks which includes orientation, the ropes course, five engagement days and the overnight camping trip. Q: Do you have to be available for all the dates on the calendar to participate? A: Yes, the time necessary to build real, meaningful relationships, requires officers to be participate in all dates of the program. The WIB Law Enforcement Leadership Team works with the supervisors of each participating officer to arrange their schedule so they can fully participate. Q: What types of officers are we looking for? A: Rising Leaders is open to sworn officers from all backgrounds and walks of life, but we are particularly interested in white officers and officers in units with high youth contact.